It’s that time of year. Panic is starting to ensue. You haven’t completed your holiday shopping, and you are starting to freak out. We’re getting to the point of no return—the point where it’s too late to purchase gifts online, and you must tackle the crowds at the department stores. It’s the worst! This got me thinking. I’m a dedicated online shopper. If I go into a department store or start browsing through the mall, something is wrong. If you see me, check to make sure I’m okay. How can browsing in a store compete with shopping in the comfort of your PJs with a glass of wine? Outside of the panic surrounding the holidays, there are people who frequent the malls year-round. It baffles me to think that they would choose to do this. Perhaps it’s the excitement of stumbling upon a deal or item you weren’t aware of, or the ability to try on and touch the item before purchase. (Now there’s a perk I can get behind—”online shopping fail” is real). I was curious to learn more about these avid shoppers—those who can’t count on one hand how many times they’ve been in the mall in the last year (or years). To do this, I decided to analyze the audiences of some major department stores to get a feel for who the regular shoppers may be and what their favorite stores are. 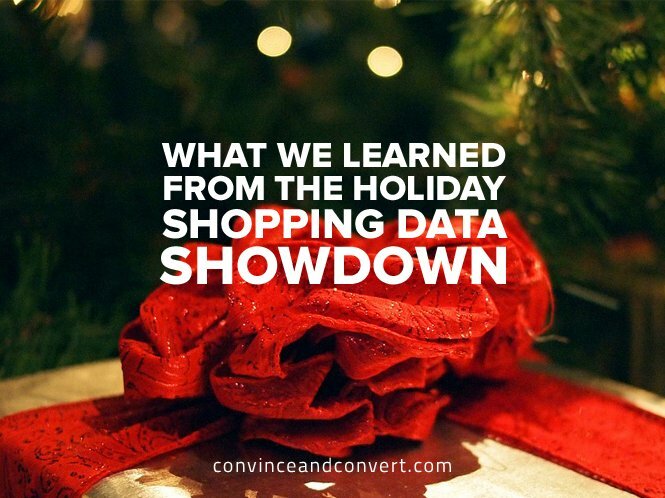 This leads us to the Ultimate Holiday Shopping Showdown. To understand who these regular department store shoppers are, I ran an interest-based segmentation analysis of the audiences of seven top department stores using Affinio, the marketing intelligence platform. This allows us to see the interest-based communities that exist among shoppers and understand which stores they prefer. The stores analyzed are Neiman Marcus, Kohl’s, Macy’s, Lord & Taylor, Saks Fifth Avenue, JC Penney, and Nordstrom. Above is an audience visualization of the 2,389,492 people in the seven department store audiences analyzed, created using Affinio. After analyzing the billions of connections that exist, individuals are grouped into clusters of like-minded people based on their following patterns. As you can see, the audience is comprised of very diverse communities. 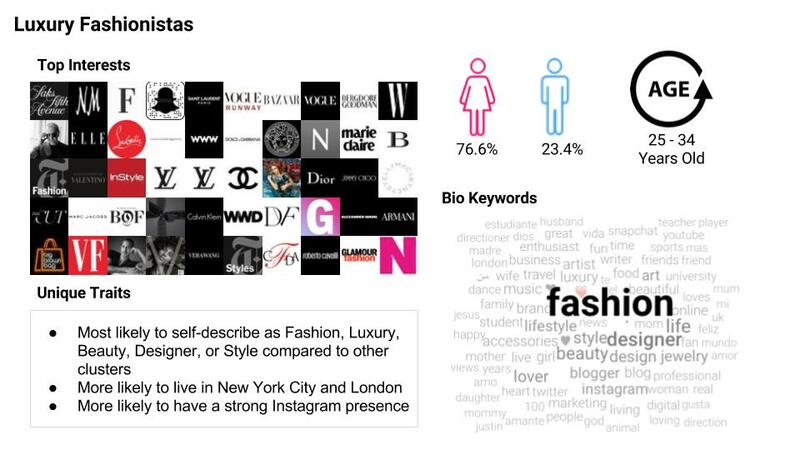 These are the various personas of department store shoppers. Let’s dive in further to see which stores they each prefer. The above pie charts show which department store each interest-based community has the highest affinity toward. Surprisingly, many of the communities have a fairly even split, or no clear favorite. Other communities, however, do have preferred stores. Among them are The Luxury Fashionistas (who prefer Saks, Neiman Marcus, and Lord & Taylor), the Pop Culture Fashion community (which dramatically prefers Nordstrom), the Country Music Fans (who prefer Kohl’s, JC Penney, and Macy’s), and the UK Fashion Moms (who prefer Lord & Taylor and Saks). Let’s learn more about these communities to understand their preferences further. Diving deeper into each community, we can learn more about what else they are interested in, how they self-describe, where they are located, and their age and gender. This gives us a better idea of what makes these people tick and why they may prefer one store over another. As you can see, while the demographics of these communities are very similar, their interests show that they differ quite a bit. The Luxury Fashionistas care about just that: the luxury associated with fashion and beauty. The Pop Culture Fashion community is more interested in what’s cool today, while the Country Music Fans care less about fashion itself—they are all about that country life and the music that comes with it. The people in these communities don’t live close to the “luxury” department stores and therefore shop at regular department stores. 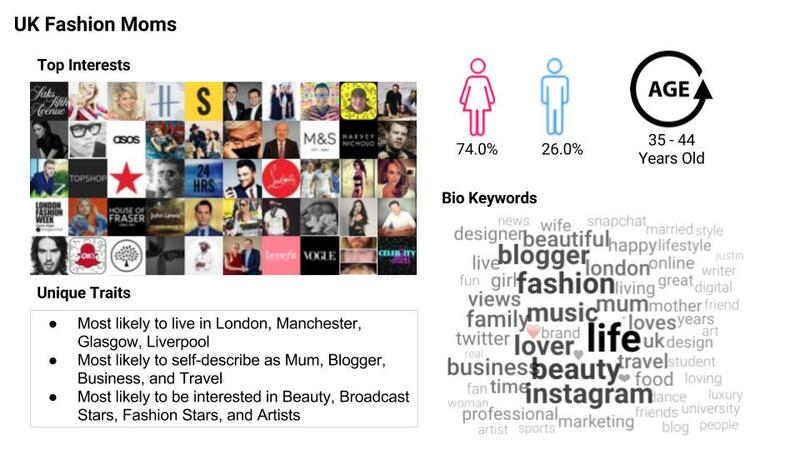 The UK Fashion Moms are completely different—aside from the obvious difference (their location), these are business-conscious people who enjoy traveling. While fashion is important to them, it’s not their main concern. Now you know a whole lot more about those year-round mall shoppers. 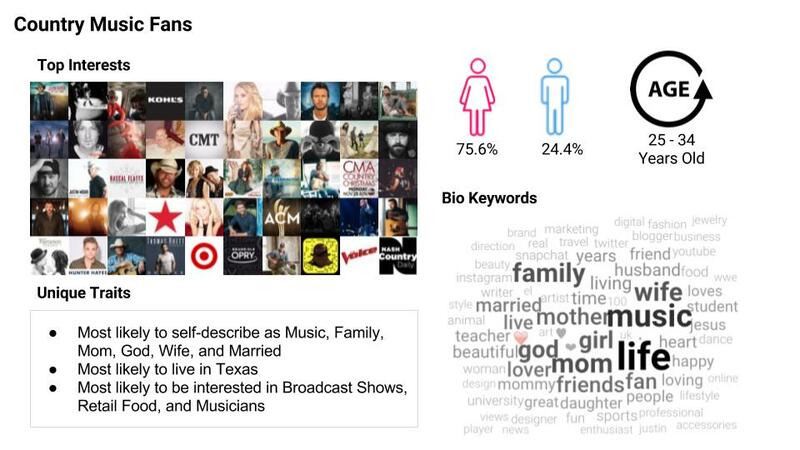 Interest-based segmentation analysis and the power of Affinio’s algorithm allows you to understand audiences you didn’t know anything about in just hours. 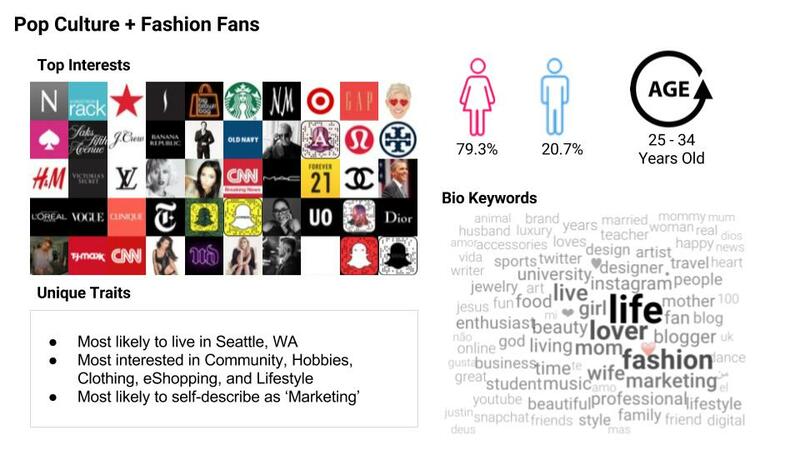 By identifying these audiences using an audience-first approach, department stores can adjust their communications strategies for each community, ensuring they align with audience interests and passions. 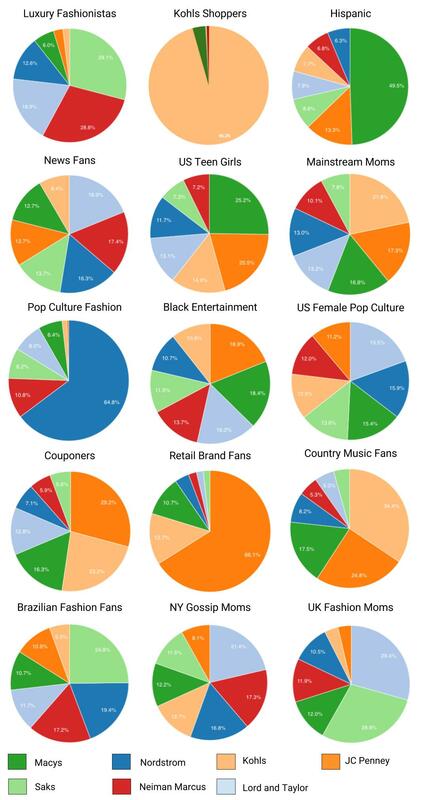 The UK Fashion Moms community and the Pop Culture community, while they share a love of shopping, have different needs, wants, and expectations of the department store selling to them. Do you fit into one of these communities?